Most subscription businesses know that churn rate is an important metric to measure. But very few know what to do with it. Some of the questions we often get are – What is a good churn rate? What is a bad churn rate? What effect is churn having on my business overall? Zuora recognizes the reality that each business is different with its own unique set of circumstances. This has led us to develop what we call the Churn Relativity Framework. The framework will help you interpret what your churn rate means for your business, and how it can guide your growth strategy. The Churn Relativity Framework is comprised of three pillars that stress the relative importance your business should place in any comparative churn analysis you undertake. Know how to measure and assess subscriber churn? Top subscription businesses know how to calculate churn, know what it indicates about their business, and know how to use it as a tool to focus the entire business to drive top-line growth. 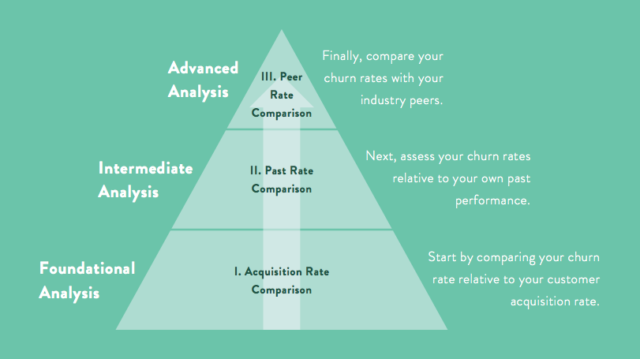 The first step in assessing your churn rate is to compare it with your customer acquisition rate. Customer acquisition rate is defined as the number of new customers added (over the same period churn is being measured) divided by the number of customers you had at the start of that period. Similar to churn rate, the formula above does not dictate a time period (monthly, annual). But make sure you use consistent time periods when comparing your acquisition and churn rates. 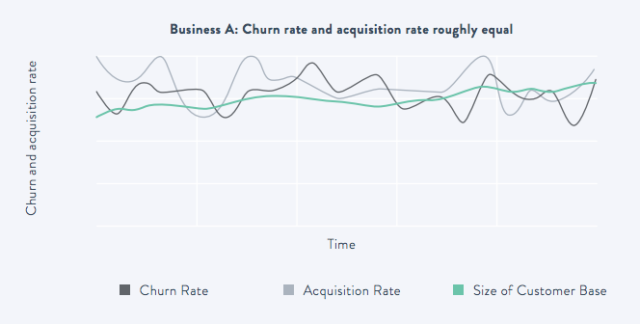 Comparing churn rate to customer acquisition rate is important because it breaks down your overall customer growth rate into its two primary components. It helps you assess whether your churn rate is sufficient to fuel exponential customer base growth, if your churn rate will lead to accelerating customer base contraction, or something in between. State 1. Subscription Equilibrium: Subscription equilibrium occurs when your churn rates and acquisition rates have been trending roughly equal to one another, as illustrated below. Over time, the business starts and ends with roughly the same number of customers. The business is flat. In this situation, the size of your customer base stays relatively unchanged — no growth, no loss. Subscription Equilibrium is a delicate time for a business because slight fluctuations in either acquisition or churn can tip the business into growth or attrition. The next chart illustrates subscription growth, a state of your business that occurs when acquisition rates are slightly greater than churn rate. All companies in the Subscription Economy want to be in state 3 – Subscription Acceleration. The chart below illustrates this state — it occurs when the rate of customer acquisition substantially outpaces churn rate. While acquisition and churn rates are flat over time, since acquisition is steadily trending ahead of churn, the business experiences an accelerating customer growth curve. The greater the delta between acquisition and churn, the more dramatic a “hockey stick” shaped growth chart the business will yield. 1. How has churn and acquisition rates for my business trended over history? 2. What impact have they had on the growth of my customer base? When looking at these charts, keep in mind this important data point – Industry studies estimate the cost of acquiring one new customer at 5-25x greater than the cost of retaining one existing customer. Consider that when you are debating whether you should increase acquisition or reduce churn rate to get your business to Subscription Acceleration — it is quite likely that customer growth fueled by reducing churn will be much more cost efficient for your business than customer growth fueled by increasing acquisition.